January 2018 - The Antelope Valley Transit Authority (AVTA) is bringing a fresh new energy to public transportation in the Antelope Valley! In 2016, The Board of Directors for the Antelope Valley Transit Authority (AVTA) set a goal of becoming the nation’s first fully electric fleet by the end of 2018, and plans to convert all of the agency's aging diesel buses to a 100% battery electric bus fleet with up to 85 new all-electric buses.The board’s decision provided the agency with clear direction and sent a strong message that AVTA is serious about its intent to be “100% Green by 2018”. When completed at the end of this year, the Electric Bus Fleet Conversion project will create a smarter, greener and more interconnected transit system that will serve the Antelope Valley and areas extending south into the Los Angeles Basin. By using groundbreaking zero emission battery electric bus technology and wireless inductive charging technology, AVTA's innovative bus project will help pioneer a new vision for what a 21st century transit agency can look like. In February 2016, the AVTA awarded Lancaster-based BYD a $79 million contract to purchase up to 85 electric buses over the next five years. The first order was for 29 electric buses, and included 16 45-foot commuter coaches and 13 60-foot articulated buses. This initial phase of the Electric Bus Fleet Conversion project is being funded through a $24.4 million grant recently awarded to AVTA from the CalSTA, plus matching AVTA and federal funds of $15 million. 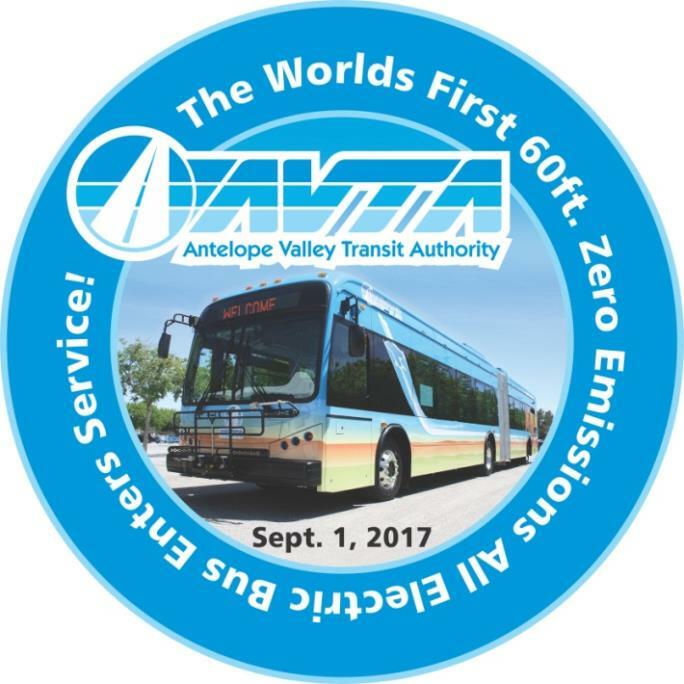 On September 1st, 2017, AVTA made history by becoming the world's first transit agency to operate a 60' all-electric articulated bus in revenue service! Charging infrastructure is another component of the project, which will use high-power wireless inductive chargers to help power the new zero-emission buses. These chargers will allow the electric buses to charge wirelessly simply by driving the vehicles over charging pads embedded into the ground. The first of these wireless inductive charging stations was completed at Sgt. Steve Owen Memorial Park (OMP), one of two major transfer centers in the AVTA service area. The station became operational on January 5, 2017. Construction of a second charging station, located at the Palmdale Transportation Center, was completed in the Fall of 2017. A Request for Proposal was issued by the AVTA in April 2016 to acquire equipment for up to 15 wireless charging stations, scheduled for installation over the next two years, with a minimum requirement of 200 kWh. A charging station of this strength has the potential to add approximately 14 miles to the range of an electric bus for every 10 minutes of charge time. The wireless charging technology is one of the most exciting aspects of this program as it relies on an inductive charging system that simply requires a bus to park on top of an electromagnet during its recovery time in order for the wireless charging to occur. As a result, zero emission buses can remain in revenue service as long as their diesel counterparts. When not in service, the electric buses charge their batteries at AVTA via hard-wire conductive charging stations. Installation of the 87 charging stations was completed at the end of 2017, and includes a 1.5 megawatt backup generator, which can power the entire charging infrastructure in case of an emergency. The transit system is already using three of the 60-foot articulated electric buses on its popular Route 1, in preparation for a future Bus Rapid Transit service along the busy corridor, which connects Lancaster and Palmdale. The buses run every 20 minutes, but the plan is to increase the route's frequency to 15 minutes, enabling passengers to connect more quickly with other routes and effectively decrease travel times. The project also calls for the 16 electric commuter coaches to provide service to routes reaching the San Fernando Valley and Downtown Los Angeles. The electrification of commuter routes will serve as a major pilot program for the State of California as electric commuter coaches are new to the transit industry.